Fierce fighting between NATO troops and insurgents in southern Afghanistan has sent tens of thousands of people fleeing from their homes in a new wave of displacement. Although numbers are unverified, the government said that more than 20,000 families had been displaced due to the fighting in the provinces of Helmand, Kandahar and Uruzgan as of November 2006. 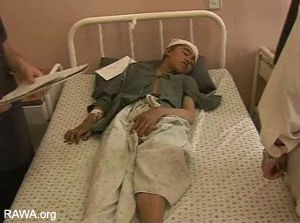 RAWA photo: Mohammad-ullah, 14-year-old boy is seriously wounded in NATO bombardment of Panjwaye village in Kandahar. In addition to this new wave of displacement, some 132,000 people – most of them displaced since 2001-2002, remained in relief camps as of September 2006. Most are Kuchi nomads who were forced to leave their home areas due to drought, but appear to be prevented from return by a combination of factors, including protection concerns in return areas. During 2006, thousands of Pashtuns who were previously displaced from the north and west of the country after the overthrow of the Taliban government in 2001 were able to return home. Since 2002, over 485,000 internally displaced and millions of refugees residing in Iran and Pakistan have returned home. However, the increasingly volatile security situation in several areas, the lack of socio-economic progress, unemployment, drought and unresolved issues related to land and property rights make the returning population particularly vulnerable. Renewed displacement due to economic hardship is not taken into account in official IDP figures. The massive growth of urban slum areas might hide significant numbers of returnees who have found it impossible to reintegrate in their former home areas. The risk of further displacement has increased in some parts of the country due to conflict and drought. This has also necessitated humanitarian assistance to the affected populations. At the same time, a successful reintegration of the internally displaced and refugees who have returned necessitates a massive long-term effort from both national and international actors in order to prevent a return to the chaotic and turbulent past. Displacement has been a constant feature of the political turmoil in Afghanistan over the past few decades. The overthrow of the monarchy, the invasion and subsequent withdrawal of Soviet forces, the short-lived Mujahideen government and the rise and fall of the radical Islamic Taliban rule each produced new waves of refugees and internally displaced people. The presence of thousands of Western troops has failed to bring stability to parts of the country. An upsurge in violence in the south, south-east and east of Afghanistan during 2006 reflects both growing opposition to President Hamid Karzai and his government and intensified fighting between NATO-led forces and insurgent groups. 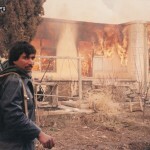 An increasing number of attacks by so-called anti-government elements – mainly a growing number of groups reportedly linked to the Taliban, al-Qaeda, Gulbuddin Hekmatyar's Hezb-i-Islami, and others – have intensified a climate of lawlessness and insecurity for the local population in some areas. More than 3,000 people, mainly militants, had been killed as of October 2006 and the rate of casualties has increased four-fold compared to 2005. NATO reports that bomb and suicide attacks have killed more than 1,000 Afghan civilians during 2006 and schools are increasingly targeted. An estimated 400,000 students are affected as their schools have chosen to close due to threats and intimidations (BBC, 13 November 2006; UNICEF, 9 November 2006; IRIN, 26 October 2006; UNGA, 11 September 2006). Admitting that parts of Afghanistan were a long way away from a post-conflict scenario, the UN Secretary-General said in his report to the UN General Assembly that "at no time since the fall of the Taliban in late 2001 has the threat to Afghanistan's transition been so severe" (UNGA, 11 September, para.4). In order to assess whether the international community's efforts in Afghanistan were on track, the United Nations Security Council members visited the country in mid-November 2006. Re-porting to the Council, the head of the mission, Kenzo Oshima, concluded that without determined efforts by its Government and sustained international support over the long haul, there was no guarantee that the country would not slide back towards broad conflict (UNSC, 7 December 2006). The upsurge of fighting in southern Afghanistan during 2006 has compelled tens of thousands of people to flee their homes to seek temporary refuge with relatives and friends in neighbouring villages, districts and provinces. In some places where insecurity has persisted, such as in the Panjwai district of Kandahar, displacement has been prolonged as the security situation has not improved. Some 10,000 families are known to have been displaced from this area (UNHCR, 3 December 2006). Displacement has also taken place in other provinces. Unverified estimates say fighting has displaced some 20,000 families in the southern provinces of Helmand, Kandahar and Uruzgan between July and November 2006 (UNICEF, 9 November 2006; UNHCR 5 October 2006; UNHCR, September 2006). More than 500 civilians are reported to have been killed in the fighting since July 2006 (NRC, 14 November 2006). The Afghan Ministry of Rural Rehabilitation and Development (MRRD) has set up Disaster Management Committees in the affected provinces to co-ordinate relief efforts (UNAMA, 30 October 2006). Apart from this new wave of displacement due to fighting in the south, UNHCR, as of September 2006, assisted 132,000 people displaced since 2001-2002 from other causes. The majority live in IDP-camps in southern Afghanistan (UNHCR, September 2006). Most of the displaced are Kuchi pastoralists who were forced to abandon their way of life when they lost their livestock due to a drought which lasted for four consecutive years. They constitute the largest single group of displaced people in Afghanistan. The remaining displaced are ethnic Pashtuns who were perceived as being supporters of the Taliban. They fled harassment and human rights violations in the northern regions after the overthrow of the Taliban by a US-led coalition in late 2001 (BAAG, October 2006). According to UNHCR, the subsistence needs of the displaced living in camps and who have been displaced for several years are largely met. The conditions regarding water and sanitation in camps are reported to be above the national average. Many have also achieved self-reliance in the places of displacement. More updated information on living conditions for internally displaced has not been found for this report, mainly due to lack of access to the areas where the displaced reside. Since 2002, over 485,000 internally displaced and 3.7 million refugees residing in Iran and Pakistan have returned home with the assistance of UNHCR. In addition, more than one million refugees and an unknown number of IDPs settled outside camps have returned spontaneously without any assistance. During 2006, only 7,200 internally displaced have returned (UNHCR, September 2006). It is likely that many internally displaced have chosen to remain in the camps instead of returning to an insecure future and difficult socio-economic conditions in their home areas. The majority of the Kuchi displaced have opted to stay in the camps where access to education, health and food is comparatively much better than in their home areas. During 2007, UNHCR has vowed to advocate for local integration of the internally displaced who remain in southern Afghanistan (UNHCR, September 2006). UNHCR is also planning a pilot project to facilitate return of a limited number of Kuchis to their place of origin in 2007. No recent IDP-specific information has been found about assistance provided to internally displaced once they have returned. Ongoing development projects in return areas by aid actors as well as work by NATO run Provincial Reconstruction Teams (PRTs), which are joint civil-military units deployed throughout most of Afghanistan, are likely to benefit many returnees. In general, the biggest challenge meeting Afghan families when they return home is the widespread poverty in their home areas. Most of those who returned to Afghanistan during 2002 and 2003, as well as many internally displaced, headed for Kabul and the main cities. While the absence of economic opportunities in rural areas and the reality of urban migration suggest that this trend will continue, the absorption capacity of urban areas, in particular Kabul, is reaching its limits (AREU, 2 November 2006). Since late 2001, Kabul's population has increased from 1.5 million to an estimated 4.5 million people. During the same period, the physical size of Kabul has expanded by only 35 percent (USAID, 3 May 2006). The US spends a staggering US$20.2 billion (RM64.6 billion) alone annually air con-ditioning troop quarters in Afghanistan and Iraq.